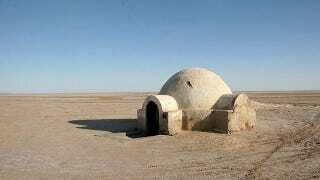 Die hard Star Wars fan might know this already but for the rest, here's your next vacation: Tunisia. Four of the Star Wars filmed in Tunisia (as the planet Tatooine) and most of the buildings are still in good shape, which means you can visit it. It's Star Wars, but instead of being a galaxy far, far away, it's on Earth. The desert igloo above is of course Luke's home. According to Los Apos, the igloo is surrounded by nothingness. Originally, it was taken apart after the first trilogy but had to be rebuilt for the second trilogy. Supposedly, it's a perfect sunset spot.